Personal Protection Tip: Do Not Limit Your Defense Against Predators to Just Firearms - As a Firearms Instructor, I am a huge advocate of citizens using firearms to defend themselves against the malevolent intentions of predators. Let the truth be told, any item that is close by and can be grabbed will in most cases be effective in protecting yourself against a threat. Common items that can be used against a bad guy include, but is not limited to, the following: a walker, a cane, a walking stick, a pen, a set of keys, a lamp, a chair, and a paperweight. It is far more valuable to have the mindset that you will defend yourself than just being set upon using a specific tool to do just that. 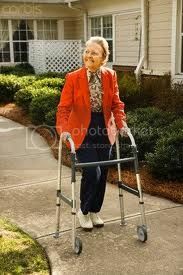 Today's tip was inspired by a 50 year-old diabetic Manchester, NH woman who needs to use a walker. She used her walker to fight and chase off a man who invaded her home. In closing, fight back and use whatever you can get your hands on to do the job.